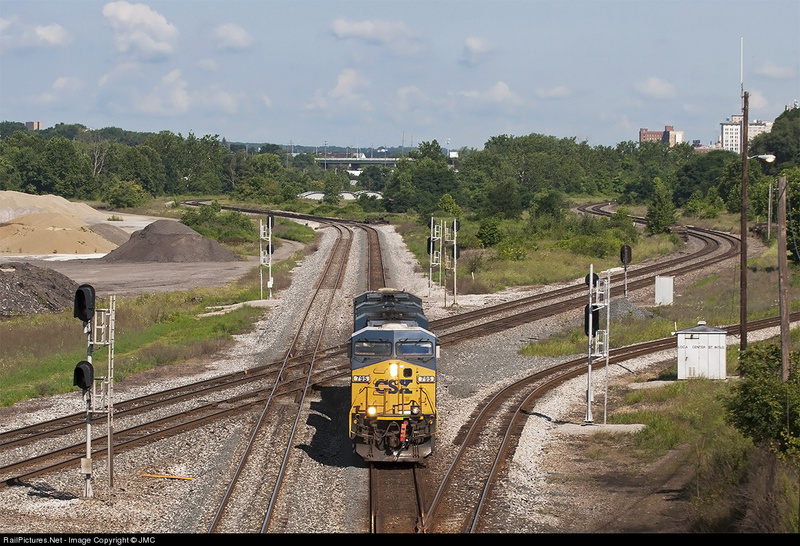 A blog devoted to explaining the ins and outs of North American railroad signaling, past, present and future. 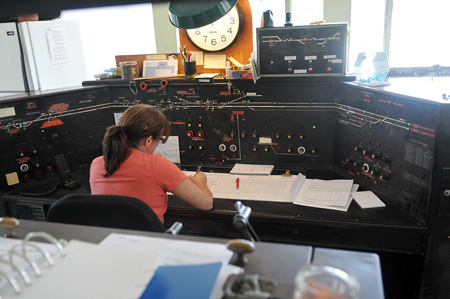 This blog seeks to preserve through photo documentation the great diversity and technical ingenuity of 20th century signaling and interlocking hardware and technology. 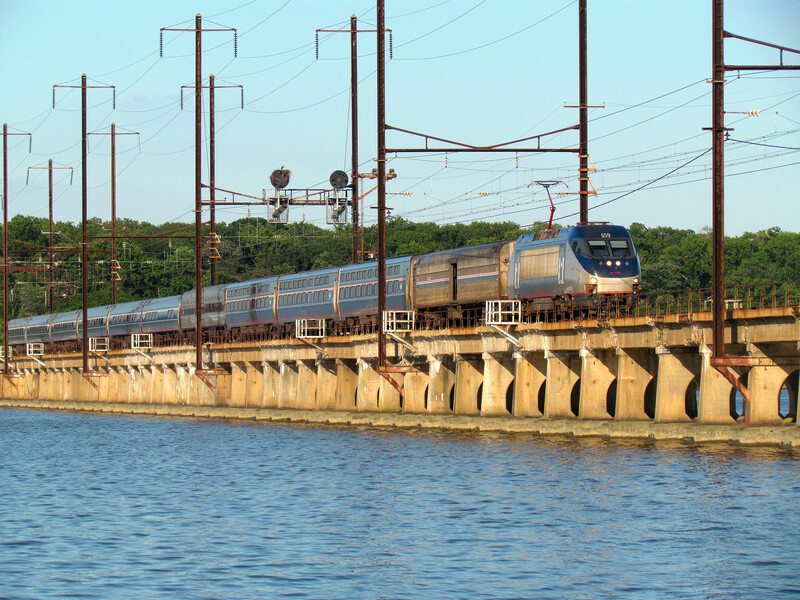 Related topics cover interlocking towers and railroad communications infrastructure. Note, due to a web hosting failure some of the photos and links may be unavailable. Well this one snuck past me. WALTHAM tower, which was creeping toward closure with a general resignaling project on the MTBA Fitchburg Line, went up and closed on June 1, 2013. I wasn't keeping track of the project too closely, but I figured there would be ample warning from new signal locations and relay boxes and neither were in evidence as of March 2013 so either the signaling crews got that stuff in in record time or they did a less destructive splice job. 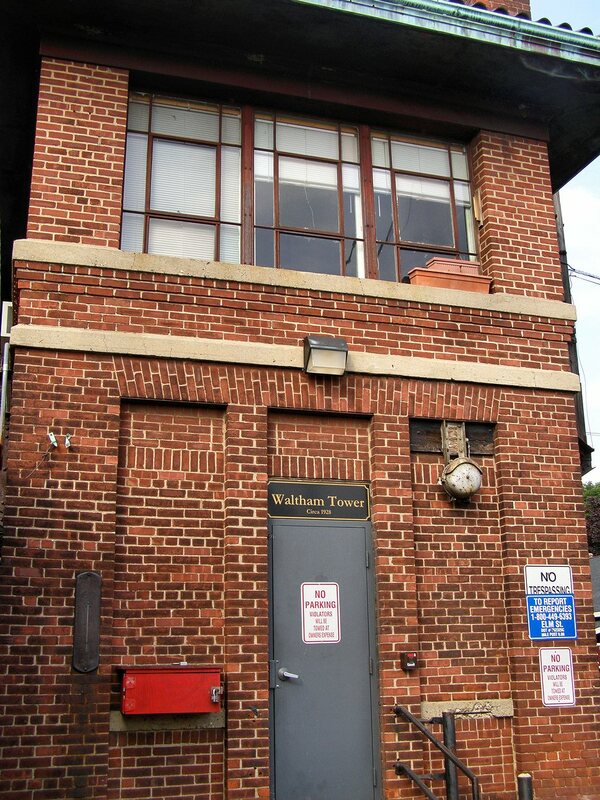 Anyway, WALTHAM was one of a dwindling number of US&S Model 14 interlocking machines still in service. While all types of classical electro-mechanical towers have been suffering from attrition, US&S plants have taken it on the chin over the last few years with UNION, JAY, HALL, DUNTON, ALTO, NS BRIDGE, WB, CORK, BUZZARDS BAY and HN all getting tossed into the bin. WALTHAM only survived this long due to the freak happenstance of it being made part of a B&M CTC project back in the 1950's or 60's. This made it a shining example of modernization when the rest of the New Englande rail scene was terribly antiquated. 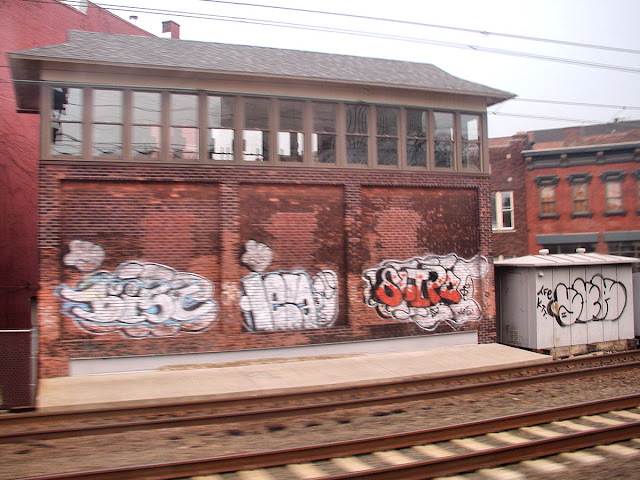 For example most of the NEC was still being run under ABS rules with block stations up into the 1990's. Inside WALTHAM was a rather modest US&S Model 14 for the local plant and a 3-panel GRS unit level CTC machine controlling the line from the terminal area through to South Acton. 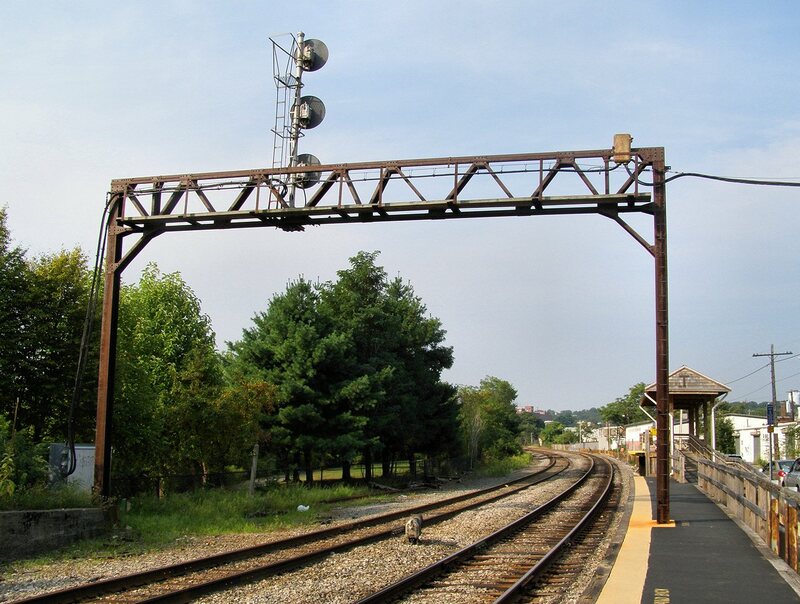 The local WALTHAM interlocking consisted of "Conrail Crossover" (two tracks going to single then back to two), with a couple of industrial spurs branching off. Both "ends" of the crossover were fully protected by searchlight signals. Despite the CTC machine most of the line was still run under rule 251 with the CTC being of the remote control only kind. The brick B&M towers are solidly built and the MTBA has been kind enough to honor it with a historic plaque and several human interest pieces in local media so it is unlikely that WALTHAM faces demolition, but there will now no longer be any place in the Boston area where a lucky kid can get invited up to see a piece of history. 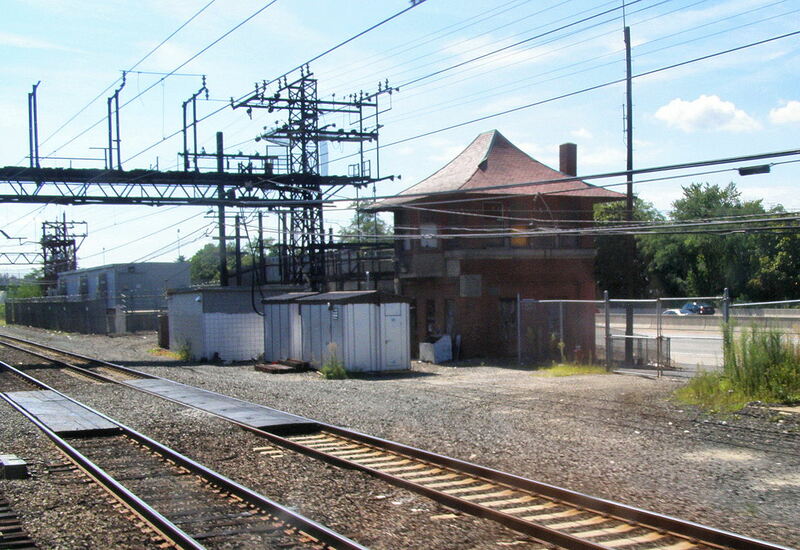 I am unsure if this is the MTBA's last active interlocking station as the movable bridges on the Newburyport/Rockport Line used to control local switches and signals although that may have changed. If you are interested in my 2010 visit to WALTHAM tower you can find the full set of photos here. If you are interested in a full Railfan Guide to the WALTHAM area you can find one written by a Position Light Blog collaborator here. I was down by Maryland's Bush river recently trying to snag some photos of the rather rare drawbridge opening there when I noticed something odd on top of the 3N position light protecting the draw span on track 3. 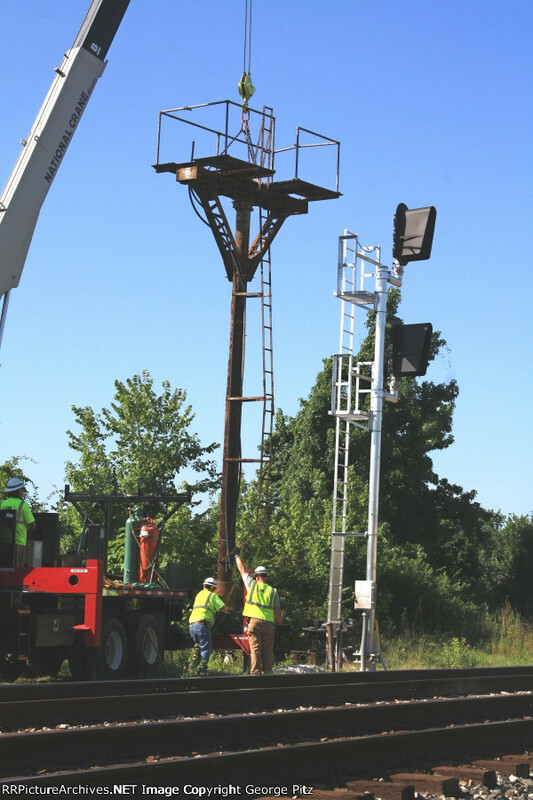 The signal had been installed only a few years ago when BUSH interlocking was upgraded with a new 80mph High Speed Turnout. Given LED lamps it also had its fully backed lower head replaced with a minimal / as clear diverging routes would not merit a Cab Speed Indication on the upper head. Using my 35x zoom that so often comes in handy for close signal photos I noticed a mess of sticks on top of the US&S position light head as well as a lot of white splotches in and around the maintainers gantry. If that wasn't enough of a giveaway an Osprey was perched on this rather impressive nest scanning around for food or other threats. Also known as the Sea Hawk, ospreys live near water and build large stick nests in elevated positions where they can survey said water for prey. While these particular signals are not in any risk of being replaced, had they been a nest of this type may have thrown a significant wrench into the project timeline as I am fairly certain it is against Federal law to interfere with the occupied nest of a Bird of Prey, although I'm sure there are probably ways around it. It also shows how signaling structures can provide valuable habitat for raptors and other flying creature...like wasps. 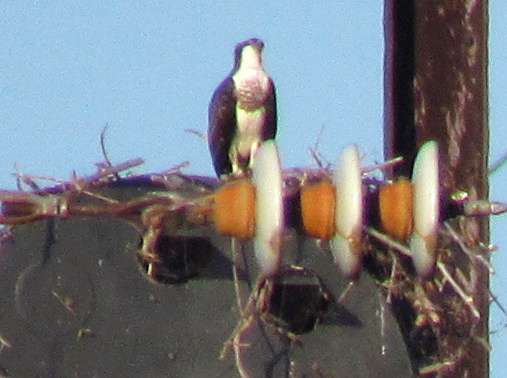 I am some come winter some maintainer is going to have a fun task knocking down the abandoned nest. Fun part is when the birds, which mate for life, return to build the nest again in the same place. 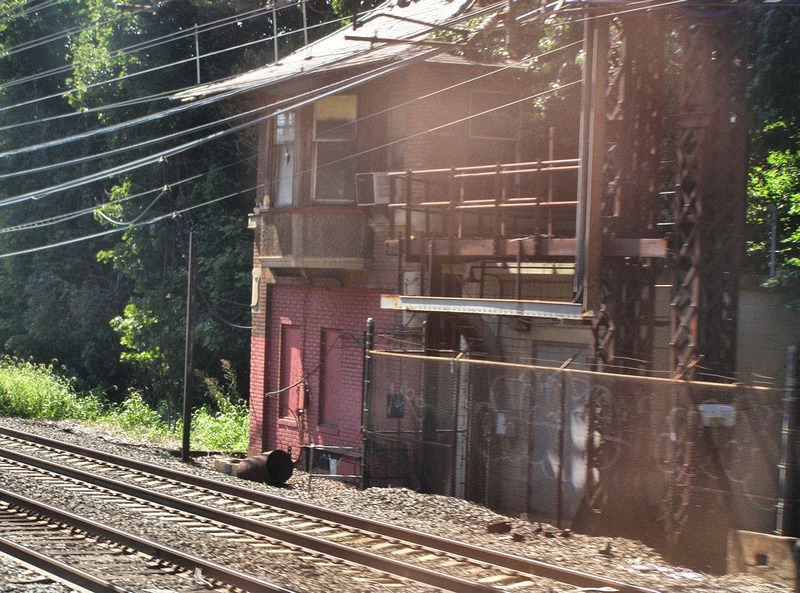 This week we begin with the CSX Philly Sub resignaling project, which completed phase 1 over the last several weeks for both interlockings and intermediate signals. 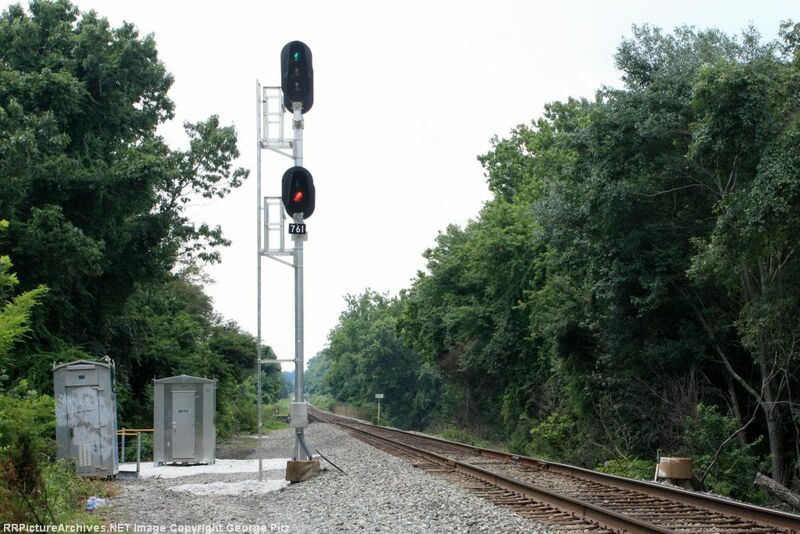 B&O CPL signals were replaced from Bayview Yard in Baltimore up through the Van Bibber siding south of Aberdeen. 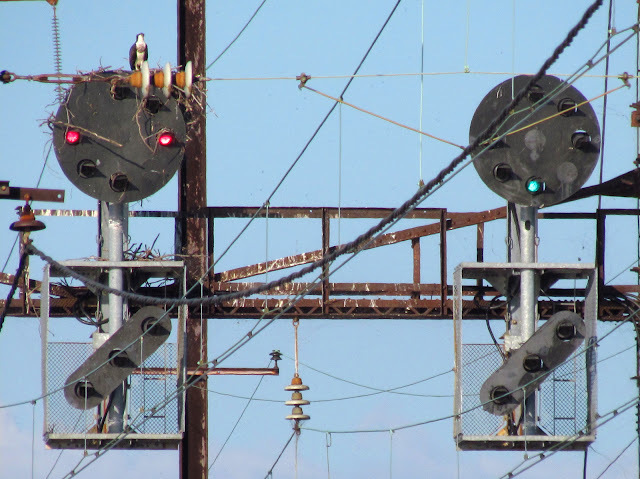 This is yet another occasion of recent re-signaling not saving classic signals as the Philly sub was almost completely re-signaled 10 years ago with pole line replacement and some of the interlockings getting new vital equipment. 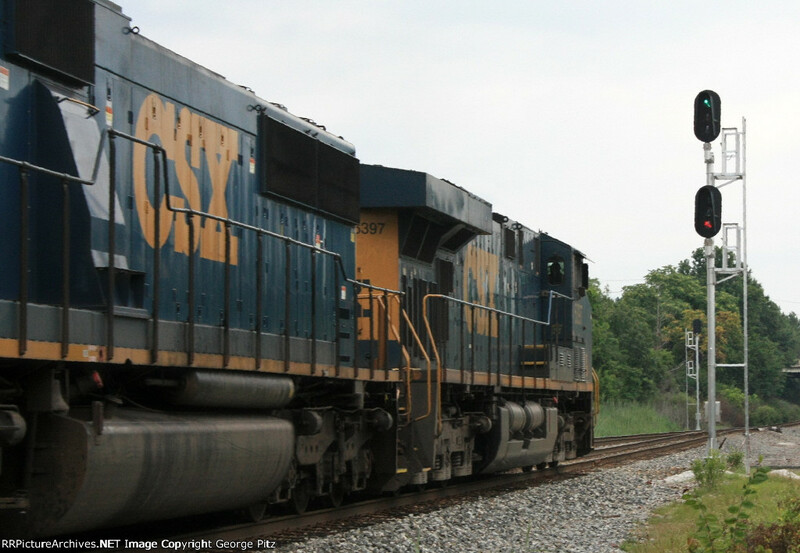 While the Van Bibber siding interlockings were still relay, Rosedale interlocking was one of those that had been modernized and was replaced like the others. I believe that Rosedale did in fact get a new Relay hut and not just a signal splice. Strangely enough the new signaling scheme has converted almost the entire line to 4-block signaling despite 2 mile blocks and 50mph speeds. Here you can see the new northbound Rosedale signal displaying Clear over the equilateral turnout with the capacity for Approach Medium as well and yes it is Approach Medium and not the Seaboard's antiquated Y/Y/ Advance Approach. Also lost were a pair of 1990 vintage intermediate signals south of Rosedale on the double track segment. Luckily over the years I have had the opportunity to fully document the Philly sub CPL's so stay tuned for a possible post devoted to them. One signal location I was not able to profile was this one at Bradshaw. You can see the new but not new enough relay box still standing next to the new new box. makes one wonder what was so different about 2000 vs 2013 in terms of cost calculations. Moving on I noticed that the fairly modern CPLs at the famous Youngstown diamonds have been replaced, but I don't think that anyone is really surprised by this turn of events. Interestingly enough there is an elephant ear target on the former PRR line which must have been a Conrail recycle job. Also note the bi-directional 4-block ABS support. 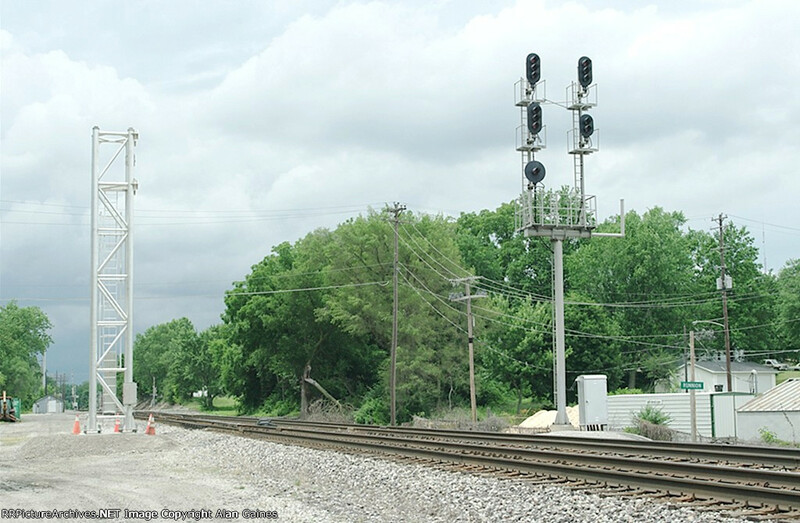 Moving on to Fort Wayne, IN on the old Nickle Plate line it seems that despite being more immune to this practice than CSX, NS is dumping a modern traffic light bracket mast in favor of a cantilever at the Runnion St interlocking. 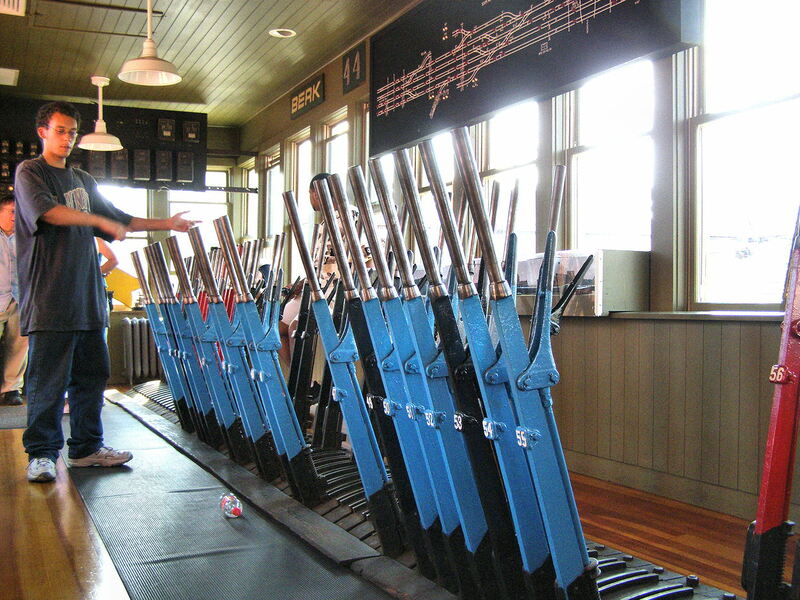 The way railroads want to spend money on shiny new signals structures you'd think it was going out of style. This is also the reason I place bracket masts of any type above searchlights on the priority list. 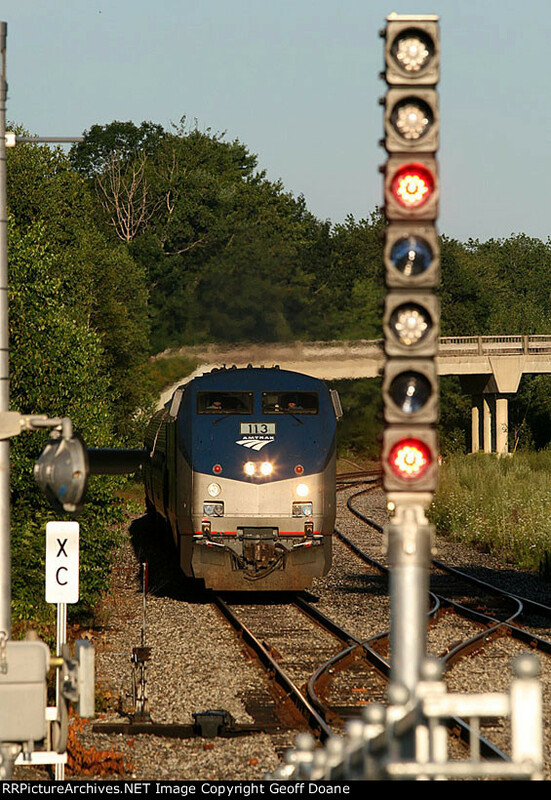 One might think Amtrak was operating a rapid transit line if you happened to see this signal at the new Brunswick, ME Downeaster station. 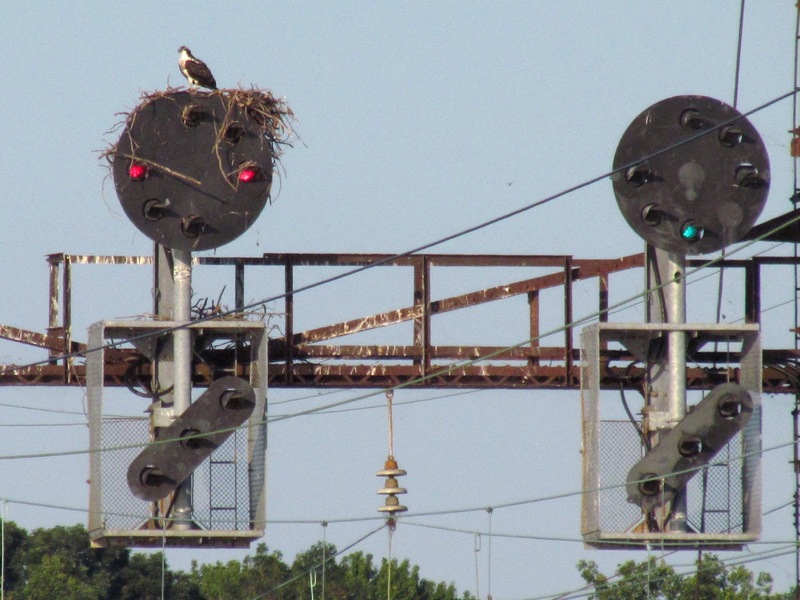 The previously un-signaled line to Brunswick, ME was given the Darth Vader treatment as opposed to the circular target signals previously preferred by the Guilford Rail System, but this 7-stack of modular Safetran dwarf heads appears to be a close quarters exception. More puzzling is the mix of LED units and traditional bulb and lens units. Can't quite determine what all this signal can display or if the lens units are Lunar or Green. I plan to head up there at some point and will investigate. 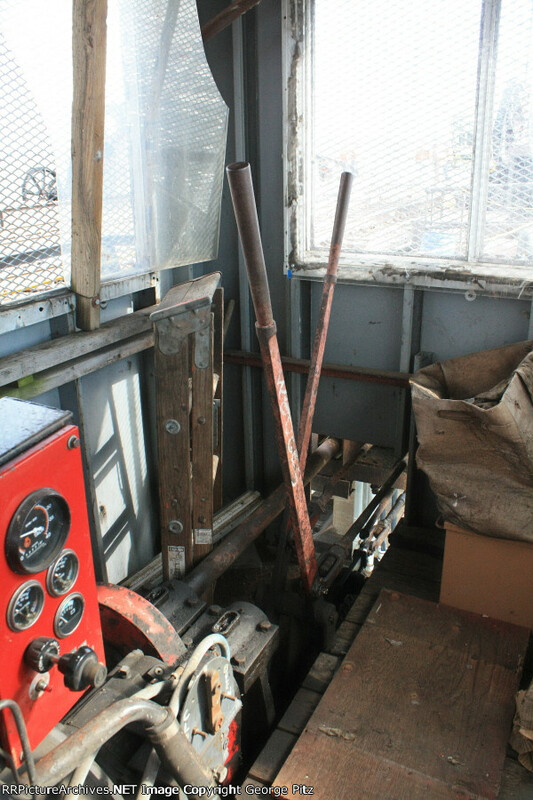 Showing once again that drawbridges are one of the major saviors of classic signaling here is a picture from inside the control cabin of Amtrak's Bush River drawbridge on the southern NEC. This movable bridge is not part of an interlocking and in fact to open it the rails must be unbolted manually. It is only opened during summer months on weekends, one in the morning and once in the evening. 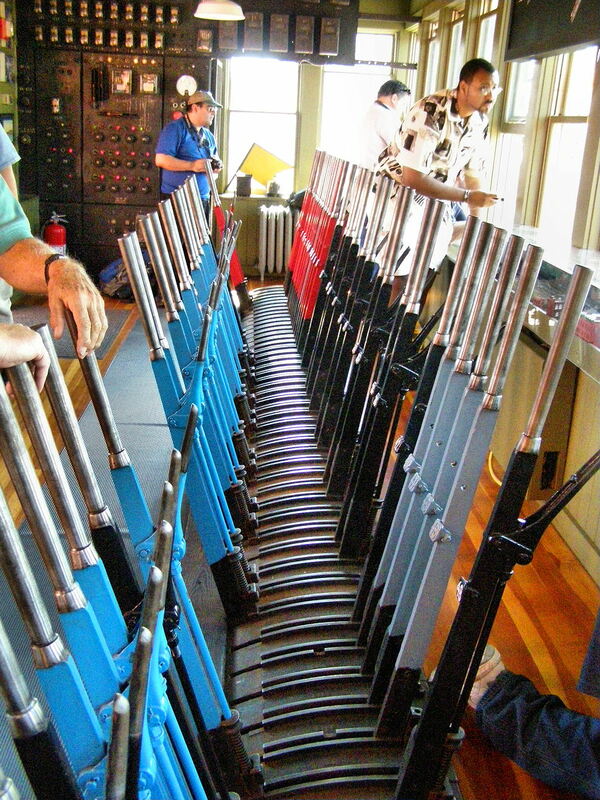 Here we see a couple of old school switch levers that move the wedges that keep the bridge locked for train movements. Next to them is the drive assembly for the short bascule span. 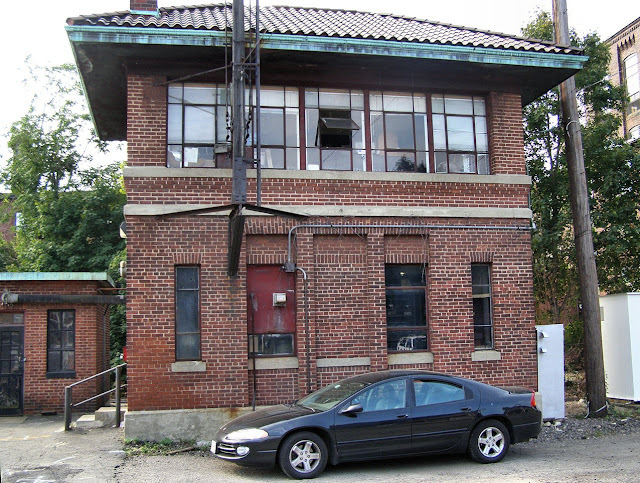 The South Norwalk Tower Museum comprises the old New Haven Railroad's SS44 (aka BERK) tower in South Norwalk (SoNo) , CT (map) preserved the way it was when it was closed around 1986. 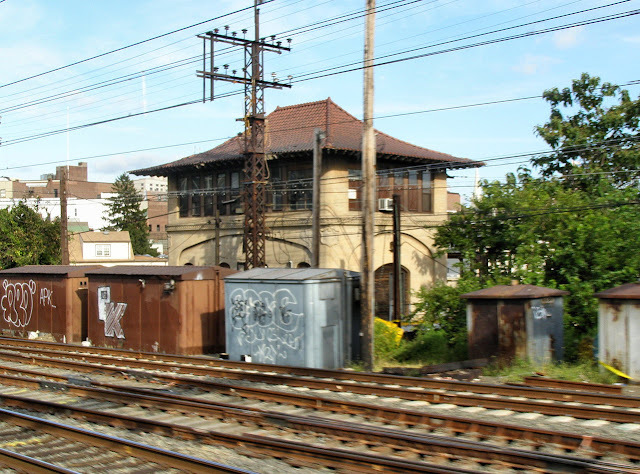 The former New Haven RR main line is operated by Metro North Commuter Railroad, which, unlike is sister Long Island Railroad (this is also operated under the umbrella Metropolitan Transportation Authority), chose to ruin two of the most interesting stretches of classic signaling in the country by replacing forests of searchlights on overhead gantries with a waysideless CSS with 3-aspect dwarf signals at interlockings. Ironically Metro North did a fairly good job of preserving all of the closed interlocking towers. One of these, SS44 in South Norwalk, was of the brick walled mechanical variety and after being boarded up was eventually sold to a preservation group in the mid-90's who painstakingly restored the tower as a museum. It is probably the only preserved tower with a substantial mechanical lever frame in North America, and a must visit for signal enthusiast visiting the New York City area. Here is a front view of SS44 taken from a passing train. The museum makes most of its money be selling a truly excellent book about itself, so if you want any further information put and order in and help support the museum. Signaling Station #44 was built around in 1896 before the "classic style" New Haven tower design came into effect with the pioneering overhead AC electrification project of 1906 and second phase of 1918. These later towers are square, cast concrete with or without brick and a hipped tile roof. Here are some examples. 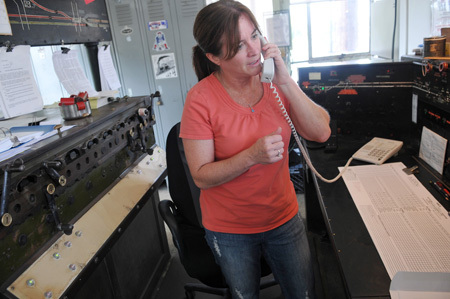 In 1919 the decision was made to upgrade the original interlocking plant at SS44 to support modern interlocking technologies such as electrically operated signals, track circuits, etc instead of attempting to build a new tower. 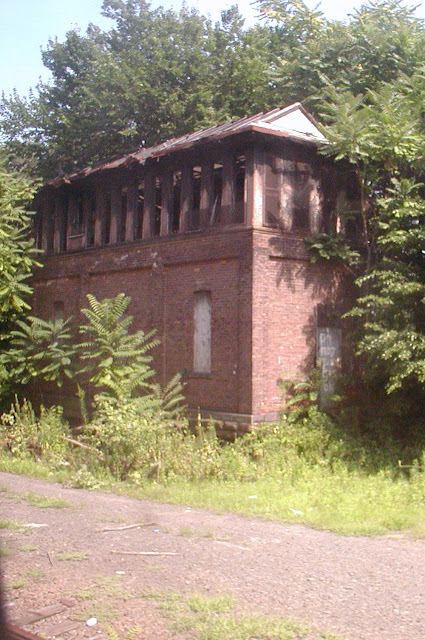 Despite the attrition of the early 20th century upgrade program SS44 does still have a surviving sister by ways of SS214 HART in Hartford, CT. Unfortunately HART was not as well preserved having suffered a fire and is now threatened by demolition. While the square footprint NH "standard" towers were designed to take all power frames or electro-mechanical frames with lever operated points and miniature lever operated signals, the narrow rectangular SS44 had a 68 lever all mechanical frame made by the Johnson signal corporation. A more accurate term for this frame might be electro-enhanced mechanical as like later E-M frames, like the US&S style S, all the signals are power operated and governed by both track relay logic and mechanical interlocking logic. 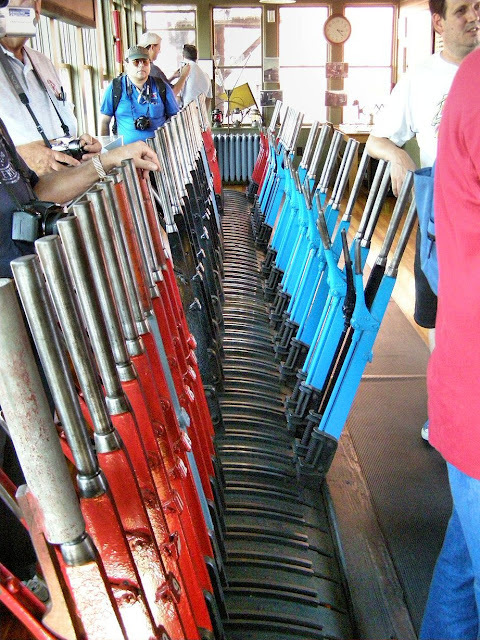 The frame was well organized with the red signal levers placed at either end sandwiching the blue and black point and FPL levers. All signal for eastward moves were on the west side of the frame and westward moves were on the east side of the frame. The lever frame has been fully restored and disconnected from the electric-locking so that one can fully exercise the mechanical locking setting up routes and displaying signals. Unlike British practice all of the points are equipped with facing point locks because trains could operate against the current of traffic under train orders on a fairly regular basis. 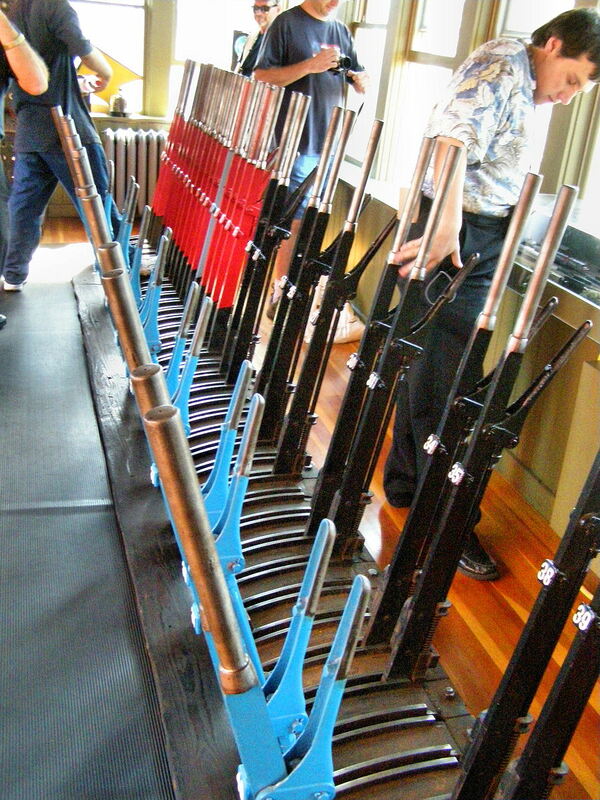 There almost seem to be more locks than point levers! So where are we today?